The developing momentum around changing the Washington, D.C., football team's name, including Bob Costas' courageous comments during halftime of a Sunday Night Football game earlier this month, has been refreshing. Using Natives as mascots, contrary to what team owner Dan Snyder or NFL Commissioner Roger Goodell would say, dehumanizes a group of people who have faced attacks on their livelihoods since Christopher Columbus set foot in this hemisphere. Many will say we have to "move on"--or that this is an issue from "the past." But Native American communities today are impacted by systematic discrimination today, as in the past--indeed, these communities have been some of the most affected by government cuts, corporate land grabs and, more recently, the government shutdown. Consider the 16-day-long shutdown of the federal government. Like in most such crises, those who are at the bottom of society get hurt the most. The Navajo Nation in Arizona is the largest tribe in the U.S. Currently, two-thirds of its budget comes from federal money because of treaty promises guaranteed to them. According to Mason Big Crow, treasurer for the Oglala Sioux Tribe on the Pine Ridge Reservation in South Dakota, of the tribe's $80 million budget, $70 million is from federal sources. If the shutdown had continued, it would have forced many tribes to cut critical programs, such as Tribal Colleges and Head Start programs. Even before the shutdown, the Obama administration and Congress had little concern for Native peoples, and were proposing more cuts and austerity. The drive to open the Keystone XL tar sands oil pipeline has left Natives on the sidelines, instead of engaging them. After a half-hearted effort by the State Department to hold "nation to nation" talks in May with Native American leaders representing 10 different tribes, tribal leaders walked out of the meeting in Rapid City, S.D. Then, on July 29, the White House held its first "Council on Native American Affairs"--without one single tribal leader being present. According to the New York Times, Deborah Jackson-Dennison, the superintendent of the Window Rock Unified School District in Navajo Nation, "is in the process of reducing the school budget to about $17 million, from about $24 million, absorbing a cut from sequestration as well as from the local government. 'It's like getting two black eyes at once,' she said. She has let go of 14 employees, and moved the school district down to four buildings from seven." Tribes argue that they should not be affected by austerity and sequestration because of treaty promises made by the U.S. government in the past. It's not just about the federal government giving tribes money, but about a nation-to-nation relationship in which the U.S. keeps its word. Obviously, we know that the United States has broken just about every treaty that it has ever made with Natives, but the legal documents still gives grounds to fight in court. The Oneida nation in upstate New York has been running a terrific campaign around the country to build pressure for changing the name of the Washington football team. Their efforts counter the idea put around by sports journalists and others that the campaign is a bunch of white liberals wanting to be politically correct. As a result, more polls are showing support for the name change. But how do people who actually live on Indian reservations feel? One of the most popularly quoted polls is an Annenberg Public Policy Center poll from 2004, which supposedly "found that 90 percent of Native Americans were not offended by the name." Never mind the flaws in the poll and that it was taken years ago--you will hear this attitude echoed among Native Americans. In a recent article from Buzzfeed's Joe Flood, Elaine YellowHorse from the Pine Ridge Indian Reservation summed up what many people on reservations think, "There are just so many other things that I need to worry about before that." From my time spent on the Pine Ridge Indian Reservation in South Dakota, I have asked many people this same question. Corbin Conroy, who was born and raised on Pine Ridge, said to me, "I don't really care. We have bigger issues to deal with on the reservation." However, more times than not, when I continue to ask questions, it becomes clear that the term "redskin" is considered a racial slur, and most would favor changing the name of the Washington football team. They just don't see this as a top priority in their life. What are their "other priorities"? Many reservations face unemployment in incomprehensible numbers--rates like 50 to 90 percent. Many houses don't have running water, and many reservations have housing shortages. In Pine Ridge alone, you may not see homelessness, but an average of 17 people live in a home. When you step on many Indian reservations, you are effectively stepping into the global South, but in the middle of the world's richest nation. Racial profiling is commonplace in areas with reservations because police recognize license plates that are from a "certain area" in the state--and a common attitude is, "They must be Indian and are up to no good." People, Native American people in particular, in my limited experience, have the ability to ignore all manner of historical insults--like the Medals of Honor still on record for the soldiers who perpetrated the Wounded Knee Massacre, or the faces of U.S. presidents carved into a site the U.S. government took through warfare, forced starvation and treaty violations. That resiliency, though, seems a pretty poor excuse for heaping on much smaller insults--like "Redskins"--and justifying them with "See? They're cool with it." Those advocating for changing the Washington team's name aren't doing so so they can feel good. Rather, they are demanding a change in a way of thinking. It's about no longer dehumanizing a people--and demanding justice for all Native people in this country. That means not only standing up to change the name in Washington, but standing up against the Keystone XL pipeline. It means demanding full sovereignty for Native Americans, and insisting that the U.S. government keep treaty promises to Natives around the country. It that means fighting the 21st century land grabs happening on Native land and fighting racism against Natives. And, yes, it means recognizing the type of racism that this country is founded on. 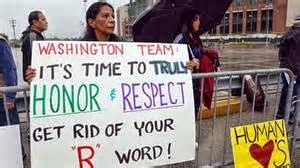 So let's fight to change the name of the Washington football team--as part of our call for justice for all Natives in this country. > The article above was written by Brian Ward and originally appeared on the Socialist Worker website.